Coming to Colorado, one of the things that Carly and I were looking forward to was the plethora of incredible camping that was within a couple hours of us. With wedding planning last year, we weren’t able to get out at all, and to make things more difficult, we didn’t even really have camping gear. This year, we made it a commitment to get our gear and get out there in the mountains. With Carly’s birthday coming up at the end of the month, camping was something that she really wanted to do to celebrate, and last weekend was one of our few free weekends in either May or June this year to do it. We were committed to going, but the weather forecast sure wasn’t giving us any confidence that this was an ideal weekend, with a high of 50 and rain forecast for Saturday. The weather is unpredictable enough in the mountains and the forecast fluctuated enough during the week that we decided to give it a try. The worst that would happen is that we would have all of our gear ready to go for the next clear weekend. Friday night, when I got home from work, we went through everything that Carly had gathered, packed up what we could, and also prepared as much of the food as we could. The weather was still a bit iffy, but we were all in at that point! 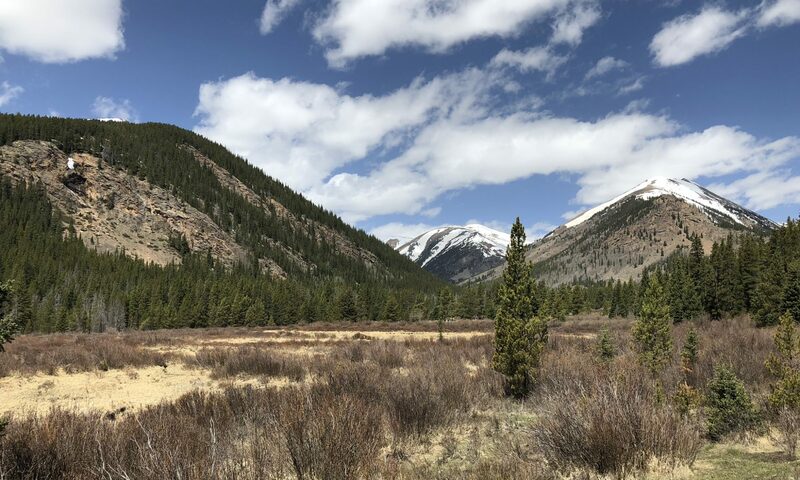 Last year, on our drive to the Mt Bierstadt trailhead, we passed numerous turnoffs along the road, Guanella Pass, where people were camping, and we had dreamed about coming back to find our own spot. We figured that it would take us around an hour and a half to get to where we were wanting to go, so Saturday morning we woke up early, packed the car with the rest of our stuff, and set out on our journey to camp in the mountains for the first time together. The weather still wasn’t giving us much hope early in the drive..
Once we reached Guanella Pass and started north from Highway 285, we didn’t make it too far up the road before we came to a “Road Closed” sign, with a barrier blocking the road. We hadn’t made it far enough to reach the turnoffs, and I started to think that this journey might be over before it started. There was a fork in the road maybe 20 yards before the barrier that led to a campground, though, so we figured we’d give that a shot. We had come this far already! We didn’t go far down that road before arriving at the campground entrance, with yet another “Road Closed” sign and barrier blocking our way. We were discouraged, but the dirt road we were on continued, so we decided again that it was worth it just to drive down and check out what was down there. As we were driving down the road, we spotted a sign that said “no dispersed camping next 1 mile”, which seemed to indicate that dispersed camping was allowed after that next mile. The road was very rocky and I’m glad we had the Jeep, because we probably wouldn’t have made it in a smaller car. We went the next mile through the trees and emerged to find numbered sites with a tent symbol on them, and, more importantly, nothing stopping us from setting up camp! It was an incredible feeling realizing that we hadn’t come all this way for nothing. The area was beautiful, private, and had amazing views. Now it was just a matter of driving down the road until we found a camping spot that was speaking to us. We wanted to be somewhere that had sun, shade, views, and was close to the creek that ran along one side of the road. We kept track of our favorite campsite numbers as we kept driving another couple of miles, reaching campsite 30 before we had it narrowed down to a few. Being the extremely indecisive people that Carly and I are, it took quite a bit of deliberating before we decided on the one we picked. Ultimately, I think we made a good choice!! Carly started unloading the car, and I started setting up the tent. Even though I was pretty sure what I was doing, it never hurts to read the instructions before you start..
With Carly’s help along the way, I got the tarp down and got the tent set up without too much trouble. The wind made things a little interesting, and the rubber mallet we brought to drive the stakes in broke on us, but we got the tent up nonetheless. Within an hour or so, we had everything set up! I built up the fire pit a little more and started a fire for us, so we were ready for the inevitable temperature drop once the sun went down. For now, though, the sun was out and we were ready to chill to the maximum. We cracked open a couple brews and sat in our chairs looking up at the snow capped peaks. This is what we came for! After a little while, I thought it would be a good idea to go exploring the forest around us in search of wildlife. Carly set up the inside of the tent wonderfully, and was perfectly content just hanging out there instead of looking for bears. I didn’t find any wildlife in the trees, which is probably a good thing, because I realized quickly how easy it is to get lost in a forest without any real landmarks. The silence in the trees was both peaceful and creepy at the same time. I didn’t want to venture too far off without having cell service or Carly knowing where I was. After I managed to find my way back to camp, our afternoon seemed to fly by, with us shifting over to the fire when the sun started to disappear behind the pines. Since we hadn’t eaten lunch and it was quickly getting cold, we began preparations for an early dinner. We built the fire up bigger so that we would have plenty of coals to cook on, and also to keep us nice and warm while we waited for it to burn down. When the coals were getting close to just right, we whipped up Carly’s world famous foil dinners that she used to make at camp when she was younger, and threw them on the coals to cook, along with a few jalapenos for good measure. The foil dinners and jalapenos took about 45 minutes to cook, and without really knowing when to open them up, they came out cooked absolutely perfectly. We chowed down and were absolutely stuffed from our dinners, but that didn’t stop us from quickly getting into the stash of s’mores that we brought. We ate more s’mores than we probably should have right after dinner, but they were just so good I don’t know how we were supposed to stop. We hung out around the fire for a while, playing gin rummy with our own made up rules (since neither of us knew what the real rules were), until the sun started to set and darkness began to creep in. We retreated to our tent for the night and fully intended on continuing to play games in the tent, but with it being so cold away from the fire and with the blankets wrapped around us, we fell asleep almost instantly. Going into the trip, we were a little worried about wildlife in the night, but neither of us heard a thing other than some light sprinkles at one point. What did end up really waking us up was the cold. Like I mentioned earlier, not getting sleeping bags proved to be a mistake, as the temperature dropped into the mid 30s, and we woke up shivering. Finally, around 5, I couldn’t take it anymore and decided to just get up and get the fire going again, because there was no way I was getting warm in the freezing tent. Once Carly woke up, we broke out our camping stove and I made some coffee before Carly cooked us some delicious breakfast tacos. We even had some moose walk by our camp, our first wildlife spotting! We started packing and cleaning up, while the fire died down enough for us to put it out. We said our final goodbyes to our incredible first camping spot, put out the fire for good, and headed out. We did a little more exploring on our way out, but we were both tired from our adventure and ready to get back down the mountains to our home.